A nightmare of crowds, fumes, and restless anger arises from the pages of this disturbing work--dour and long-winded perhaps, but ultimately eye-opening and perceptive. In Bombay, one must first find a place to stay; once that's done, it's possible to make money there. So say several of the Bombay residents with whom Naipaul talks during this exploration of modern India--an attempt to follow up on a yearlong journey he made there in 1962, to understand the changes his parents' native country has experienced since then. The problem of a place to stay in Bombay (or anywhere else in India) is a daunting one: astronomical apartment prices have led to "huts and shanties and rag-structures" that fill the city's nooks and crannies, single rooms housing families often, and miles of stinking slums. Such overcrowding engenders restlessness and sparks of temper--anger that, mixed with an economic climate that has provided some of the most downtrodden with their first taste of ambition and hope, results in an uncontrollable sense of outrage. Freed from the fear of starvation, sects begin to talk of independence and revolution. In the Punjab, terrorist Sikhs stage executions. Across India, low-caste housewives spend precious coins on "Women's Era," a mindless magazine that nevertheless respects their primitive level of existence. "During this transition period," a government minister explains, "we are slowly cutting from the moral ethos of our grandfathers, and at the same time we don't have the westerner's idea of discipline and social justice. At the moment things are chaotic here." 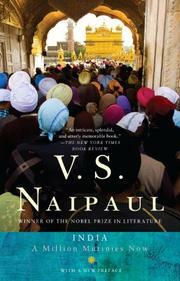 Naipaul's book suffers from his own absence--much of it is devoted to recounting the life stories of men he meets--but his summing-up proves typically powerful (and surprisingly optimistic) as he suggests that India's emerging sense of nationhood may ultimately survive these inevitable, multiethnic, "million mutinies."